The organization of the telecommunications industry in Egypt still represents a relatively traditional structure in that the incumbent operator, Telecom Egypt, remains the dominant player. The Egyptian government is, however, steadily moving towards deregulation within the telecommunication market The creation of the Ministry of Communications and Information Technology (MCIT) in 1999 reiterated its firm commitment to encouraging technological development. The current reform process classifies Egypt as one of the more forward-looking of the Arab States. In particular, the process of corporatization of the incumbent has already taken place, the separation of regulatory and operational functions is underway, and the privatization of the incumbent is at an advanced stage of planning. However, the most dramatic changes in the sector have been brought about by the introduction of competition in mobile communications and Internet service provision. Although Telecom Egypt retains the monopoly on fixed-line voice and the provision of international connectivity, as of 1 April 2000, there were some 1’251’000 cellular subscribers shared between ClickGSM and MobiNil. The Egyptian ISP market is fully liberalized and highly competitive, at least in Cairo and Alexandria, with over 60 ISPs offering a range of services, including dedicated, dial-up, pre-paid and premium services. There are approximately 55’000 paying Internet subscribers and an estimated 250’000 Internet users. The market is currently expanding rapidly, especially after the introduction of a new premium-rate dial-up service (a 900 number for accessing the Internet) for which Telecom Egypt shares revenues with ISPs. The market is also showing an increasing degree of consolidation. Orascom, one of the shareholders in the leading cellular operator MobiNil, is also the biggest player in the Internet service provision market and owns 75 per cent of Egypt’s largest ISP, LINKdotNET. The tie-up with the mobile operator is significant in that WAP services were introduced in May for a trial period, making Egypt one of the first countries in Africa to have introduced WAP. 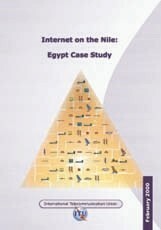 A mission to Cairo was carried out in May 2000, involving Tim Kelly and Guy Girardet from the ITU and Magda Ismail, formerly of the Ministry of Communications and Information Technology, (MCIT) Egypt. The team met with senior officials from the ministry, regulator, the fixed and mobile operators, trade associations and major Internet service providers. They also met with officials from the health, education and tourism sectors.